Considered under pressure to keep the No. 10 jersey before the series began, Barrett produced a masterly performance to guide the All Blacks to a 2-0 lead in the three-match Bledisloe Cup series. He was also instrumental in New Zealand’s 38-13 win in the first test in Sydney last weekend. It was New Zealand’s 30th win in their last 34 tests against Australia, ensuring they remained unbeaten against the Wallabies at Eden Park since 1986, and extended their winning streak in all tests at the Auckland stadium to 42 matches since 1991. Once again, as they did in Sydney, Australia threw everything into their first-half effort and the teams were approaching the break at 7-7. But Barrett’s try immediately before halftime gave the All Blacks the lead and a surge of confidence which was manifested in two tries in the first seven minutes of the second half. 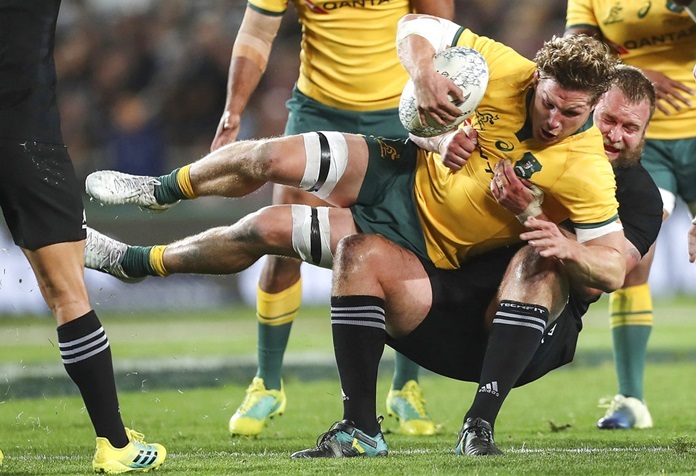 Lock Brodie Retallick was again massively influential as the All Blacks demonstrated that they are more skilled, more physical and more cohesive than Australia, who are increasingly under pressure to reverse a slump in form. Australian Rugby has endorsed Michael Cheika as coach through the 2019 World Cup but his position won’t be helped by this defeat by six tries to two.